An individual offer is an invitation you give for a content creator to participate in your campaign. The offer will contain a list of tasks that have to be completed within a certain time frame in exchange for compensation or products. If the creator accepts your proposal, it will become a legally binding contract. For an explanation of the different types of offers have a look here. Wait until they respond to the offer – they can either accept, decline, or negotiate the offer. If they agree to the offer, you’re good to go! Note: The influencer may want to negotiate on deliverables, budget, or another part of the individual offer. If this happens, the brand must update the individual offer and send it again. As the offer is legally binding the creator will need to accept it again. 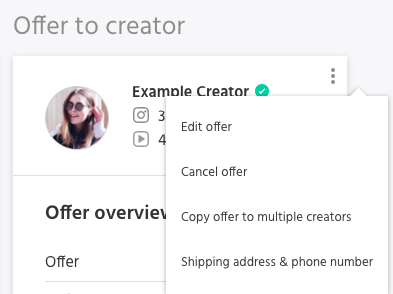 If you want to send the same individual offer to multiple content creators, you can use the "bulk offer" -feature to send out the same offer multiple content creators at the same time. You can find the functionality in the three dot context menu either on the "Participants" -page or in every individual offer. Just click on "Send offer to multiple creators" or "Copy offer to multiple creators" and follow the instructions in the modal window. Be careful not to overspend your budget, as sending multiple offers simultaneously can quickly increase your spending. Tip: You can copy a previous offer to quickly invite another Content Creator by clicking the button at the top. Or duplicate tasks by clicking on the duplicate icon. Product Delivery: For all offers, there will be a checkbox asking if there will be a product delivery for this offer. This will prompt the creator to input their shipping details when the offer is accepted.